Prof. Sarah Pedersen of Robert Gordon’s University, Aberdeen, gave a fascinating talk on the history of the Suffragette movement in Scotland. She covered the development of the movement from the constitutional Suffragist organisation of Millicent Fawcett through the more militant Women’s Social and Political Union (WSPU), otherwise known as the Suffragettes, lead by Emmeline Pankhurst and, in Scotland, Teresa Billington-Grieg and Helen Fraser. 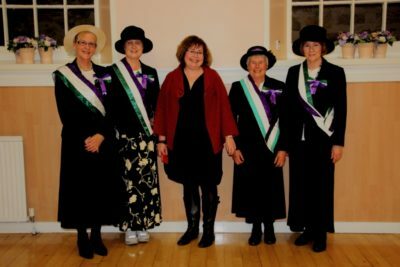 Prof. Pedersen presented a very lively coverage of Suffragette activities in Dunfermline and across Scotland including the demonstrations, interventions in elections and the incidents of violence against property. She covered the whole period until the suspension of the campaign on the outbreak of the First World War and the partial success after the war, when voting rights were granted to some women over 30. Full emancipation was not achieved until 1928. 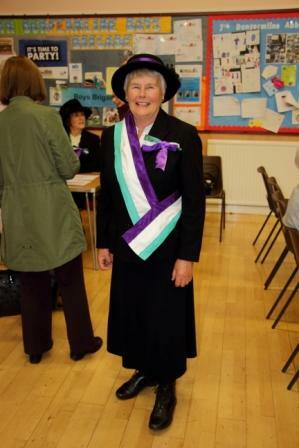 The topic inspired some of our members to turn out in appropriate dress, featuring the Suffragette colours of Green, White and Violet, or Give Women the Vote. Sarah is Professor of Communication and Media at Robert Gordon’s University, Aberdeen. Her research interests are focused on women’s engagement with media, whether that is contemporary digital media, or historical newspaper archives. 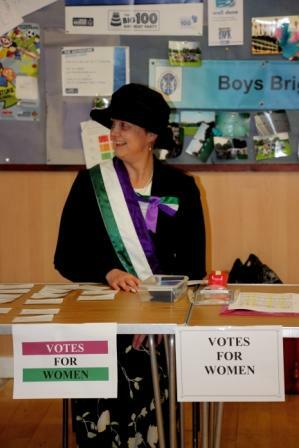 Her research on the suffragettes in Scotland is based around analysis of local newspaper archives and this summer Palgrave Macmillan published her book ‘The Scottish Suffragettes and the Press’.